The TBTI transdisciplinary fisheries cluster was established after the 2nd World Small-Scale Fisheries Congress to raise awareness about the need for transdisciplinary thinking in fisheries research and capacity development, particularly in relation to small-scale fisheries. The cluster aims to develop a ‘transdisciplinary fisheries course’ that can be taught as part of a degree program or as part of a training program to develop local capacity. One of its first tasks was to bring together a diversity of researchers to exchange ideas and perspectives about transdisciplinarity and, building from the Merida conference, work collaboratively to develop some elements of the transdisciplinary learning materials. The collaboration took place from February – April 2015 and involved 28 participants. 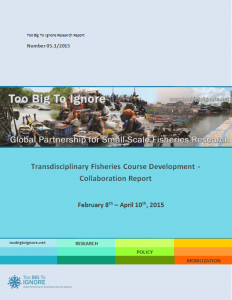 To see the outputs from the first phase of the collaboration including course principles, philosophy, and goals, as well as preliminary suggestions for course topics download Transdisciplinary Fisheries Course Development Collaboration Report Final.